The Waterproof Mascara Remover. This is our #1 seller – the Middle East’s favorite makeup remover wipe! It effectively sweeps away make-up and impurities, and even waterproof mascara, while being gentle on your skin. The refreshing makeup wipes will leave your skin cleansed, soft and make-up free! 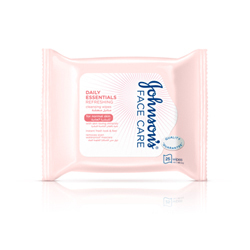 Refreshing Facial Cleansing Wipes -- for all skin types is rated 4.8 out of 5 by 33. Rated 5 out of 5 by Samiyasultan3 from Best makeup remover Helps remove makeup easily,not irritatable on the skin,mousturizes the skin and gives you a fresh look.these tissues will last for long tho you use them daily. Rated 5 out of 5 by Ani P from The best wipes These wipes not only cleanse my skin but also refreshes me. My skin becomes so smooth. Totally love using this product!